This is for one person and one person only. For my big brother Jason. GREAT!! Thanks for reminding him. Now the carrot lady will return. No way I'm clicking that link!!! If I had not grown to love you two Mormon siblings so much, I would declare you weird and stop reading. But alas, I am hooked. Bring on your orange bath tub pics. 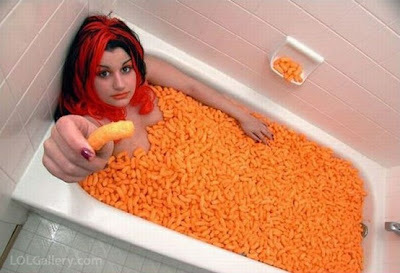 Cheeto Girl? My heart be still. That is WAY better than carrots! And I must admit. She is way cuter than carrot lady. I love how janjanmom knows all about Carrot Lady.